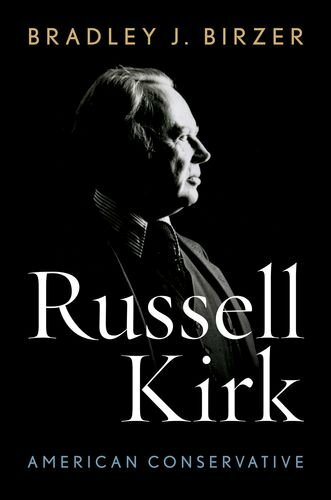 A timely biography of Russell Kirk. At a gathering of the conservative organization, The Philadelphia Society, a few years ago, Bradley Birzer gave a talk about Russell Kirk and Leo Strauss. It was, perhaps surprisingly, spellbinding. Those in the audience knew, or thought they knew, that the conservatism of Kirk and the esoteric philosophy of Strauss and his disciples were opposed and could not be reconciled. The wizard of Mecosta was famous for elaborating a conservatism of tradition and order traced to Edmund Burke and Christianity. Strauss and his school emphasized the thinkers of modernity—Machiavelli, Spinoza, Locke, Hobbes, et al.—in the light of unconventional readings of classical philosophy, with little space for traditional religion. In the judgment of Strauss's epigones, America was far removed from the concrete tradition Kirk wrote about in books like The Conservative Mind and The Roots of American Order. In his talk, Birzer exploded these assumptions. Kirk and Strauss not only knew one another but were supportive of each other's work. Strauss even tried to get Kirk a position in Chicago, where Strauss was teaching. Kirk for his part respected Strauss's learning despite his disputes with subsequent Straussians such as Harry Jaffa. Kirk and Strauss met in the 1960s, and Kirk continued to praise him as late as 1990, though by that time Kirk has been subject to attack by several of Strauss's students. The talk was a tour de force. The substance of this talk is included in Birzer's long-anticipated book on Kirk. Although he does not shy away from the clear differences between Kirk and Strauss, Birzer's account of the relationship between the two highlights a number of illuminating points about Kirk: his personal intellectual curiosity and generosity, his integrity, and also the efforts of others to brush away this history for their own ends in the name of a conservatism that Kirk would not recognize. And it suggests the indefatigable work Birzer did in compiling his deeply researched book. Also particularly valuable is Birzer's account of Kirk's split from Modern Age, a journal he himself founded, because of the influence of the "anti-Jewish and anti-Catholic ignoramus," David Collier. For such corrections to the historical record, this book is invaluable. But in addition Birzer's biography makes the case that Kirk remains indispensable for conservatives today. Born in 1918, the son of a railroad engine-man in Plymouth, Michigan, Kirk grew up between the reality of industrial America and the more exotic life of his relations in Mecosta, who inhabited a grand residence called Piety Hill, named for the spiritualist séances conducted there. Kirk enjoyed recounting ghostly tales featuring the house and its spectral inhabitants, some of which made their way into his ghost stories. The greatest family influence on Kirk was his maternal grandfather, who modeled a Christian Stoicism that characterized Kirk all his life, even after his adult conversion to Catholicism. Kirk was drafted for service in World War II, where Birzer places Kirk's intellectual awakening. In the Utah desert where he had been stationed, Kirk wrestled with questions of his life's purpose and read widely. He also acquired a strong distaste for big government and the inhumanity of modern warfare, which he opposed for the rest of his life. Birzer in particular notes Kirk's rage at the internment of Japanese Americans during the war. After his military service, Kirk returned to Michigan but then entered graduate study (he had already received a master's from Duke) at St. Andrews University in Scotland. Birzer, who holds the Russell Amos Kirk chair at Hillsdale College and is the author of a number of works on figures such as Christopher Dawson, J. R. R. Tolkien, and other "Christian Humanists," places Kirk within this larger tradition. This is partly true, especially of his later life. As Birzer notes at the outset, Kirk's initial influences were not Christian Humanists: Irving Babbitt, Paul Elmer More, Albert Jay Nock, and the now almost-forgotten libertarian writer Isabel Paterson (of these, More might be the closest to the Christian Humanist outlook). Kirk's experience of the medieval Scottish university lessened these individualist influences, so that by the late 1950s they had all but disappeared. His Scottish experience also cemented in him an appreciation of the idea of place; as Birzer writes, "[f]or Kirk, St. Andrews represented a fixed point in Western civilization. Around it swirled various pagan, Protestant, and Catholic peoples over and across time. St. Andrews served as a living palimpsest, the past never completely disappearing as the various cultures evolved." When Kirk himself moved into Piety Hill and made it his home, it became such a place, filled with the past but also welcoming refugees from across the world. Beginning in this period, Kirk more strongly embraced a Christian Humanist tradition, and Birzer notes in particular Kirk's championing of writers like Dawson, whose Christian vision of history stood sharply at odds with secularizing "objective" history.